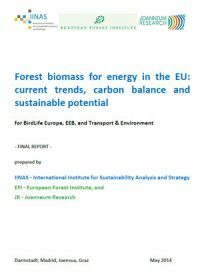 Forest biomass for energy in the EU: current trends, carbon balance and sustainable potential describes a study that aimed to clarify possibilities and implications of woody bioenergy supply for the natural environment and climate for the European Union by 2020 and 2030. The study estimated the amount of forest-derived and woody biomass that could be sustainably supplied for energy uses without compromising material uses of wood. Particular attention was given to the biodiversity and GHG emissions implications of woody bioenergy supply. The role of sustainable woody bioenergy in the future EU energy system was analysed for electricity, heat and transport fuels, taking into account the potentials for energy efficiency, and non-bioenergy renewables. This final report was commissioned by BirdLife Europe, European Environmental Bureau (EEB), and Transport & Environment. The publication is co-authored by International Institute for Sustainability Analysis and Strategy (IINAS), European Forest Institute (EFI) and Joanneum Research (JR).